Action! Suspense… DRAMA and wHiMsY. 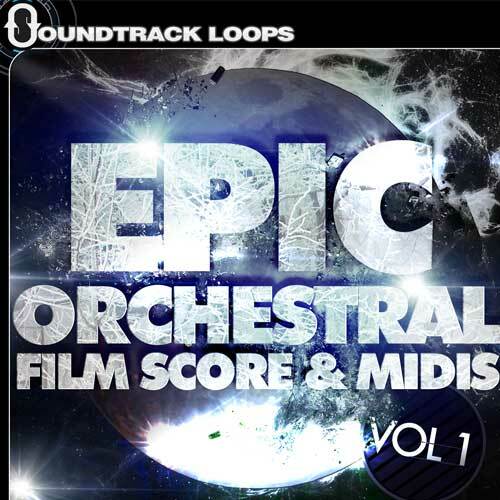 Use 'Epic Orchestral Film Score & MIDIs' for your next project and it’ll become a masterpiece! Sounds include violins, violas, trumpets, cellos, clarinets, cymbals, timpanis, marching snares, basses, chimes, harps, french horns, oboes, bassoons, and more. In total there are 145 long 16-32 bar loops for six Kits and supporting MIDI performances for five of the six Kits. Remix each piece into a customized soundtrack or use the instrument loops as standalone elements to sculpt screen action into crescendo. All film aside, Soundtrack Loops also recommend using these sounds in other genres such as Trap, Hip Hop, Dubstep, EDM, Breakbeat and Industrial. Three Kits are in the 80 BPM range and three Kits are in the 120 BPM range. The various keys are as follows: a minor, c# minor, c minor, A major, C# major, and F# major. Good for battle scenes, high action, drama, soft and playful, epic adventure, and, of course, scenes of suspense. Composed by John Hobart (Scorpio Music Productions). 24-Bit/44.1kHz Stereo files. Tempo and key information are in the file names as well as metadata.